They say that the best way to lure a journalist to cover your story is to feed them. On an unseasonably warm, sunny day in January, Fatz Café did just that. The food in question, which was delicious and more than this reporter could even eat, included items from their seasonal Fish Camp menu that launched Feb. 15 and from their new core menu that launched Jan. 31. The revamped offerings are just one of the hallmarks of new CEO Jim Mazany, who took the helm of the Taylors-based chain in October. If that’s his goal, Mazany is off to a great start. All fried items will now be cooked in the same manner as the chain’s popular lightly breaded and fried Calabash chicken. 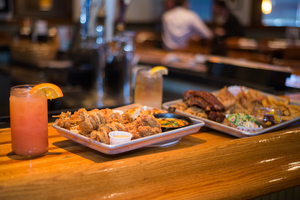 Platters are served with a soup, revamped broccoli slaw and French fries, along with a mason jar of homemade pickled vegetables that might possibly be the star of the show. Fatz’ new menu is a change from typical restaurant trends, and the team hopes to use that to drive business. Bigger and better, indeed. According to Painter, the chain updated, changed, or introduced 30 items. Items that didn’t reflect the chain’s southern brand were removed, including the Asian chicken salad and the Mediterranean tilapia. “The brand has been around since 1988, but I think we’re getting back to our roots and getting back to the core qualities the brand was founded upon,” Mazany says. So far, the men say test audiences and patrons have responded well to the menu changes. Part of their cuisine’s popularity is their commitment to using local ingredients wherever available. Mazany has had plenty of experience doing the right thing in the restaurant industry. Prior to joining Fatz, he was the president and COO of the Joe’s Crab Shack system, a $400 million annual revenue brand with 130 locations nationwide. He’s also worked with national brands such as Applebee’s, TGIFridays, and Romano’s Macaroni Grill. The decision to join Fatz was an easy one for this 30-year restaurant veteran. The Fatz brand currently has 46 locations across Tennessee, Georgia, and the Carolinas. Mazany hopes to ramp up growth by moving into newly developed markets that customers are now living in. With all of the restaurants out there, particularly in the Greenville market, the restaurant business is a hard business to be in. Mazany says that continued craveable food offerings and genuine southern hospitality are what sets Fatz apart from the competition. But the brand perhaps has no better advocate than Mazany. He is hands-on with the menu creation as well as the expansion and business side of things. In the end, it’s his passion that drives him, and ultimately the restaurant chain, to success.